Muscovite is a member of the mica mineral group. It is more important as a rock-forming mineral than as a collectible specimen. However, many beautiful muscovite specimens are found in conjunction with other fine minerals such as quartz, tourmaline, topaz and beryl. One particular variation, the Star Muscovite, is valued for its unique 5-pointed cluster formation. 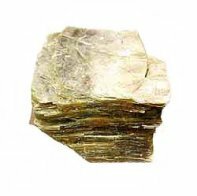 Muscovite is used as an insulator in heat and electrical applications. Its resistance to heat made it perfect as the “window” in ovens before synthetics were developed. Muscovite sheets are durable. They maintain their shape even after a great deal of weathering and exposure. Because of this it was used as windows before glass production was chear and inexpensive. Muscovite is responsible for the shiny glimmering flecks found in many sands.